Can there be open source music? Open source software has come a long way since the moniker "open source" was first coined in 1998. The Cathedral and the Bazaar helped to explain this new paradigm of software production, and history has proven that the profound implications predicted by Raymond’s essay were not only credible, but now also obvious. And perhaps because of the open source software community’s awesome record of success, those who work outside the strict boundaries of software development have started to wonder: Are there new paradigms, based on open source principles, that could rock our world, too? We have seen this happen in the world of creative content with Creative Commons. Larry Lessig, following a straightforward reading of the US Constitution and building on many of the insights published years earlier by Lewis Hyde in the book The Gift, realized that while there was nothing wrong with commercializing content per se, there was something very wrong about treating cultural resources as private, alienable property forever. Lessig believed, and I agree, that there is a benefit to giving the public some agency over the content that defines their culture, just as open source gives other developers—even users—agency over the software they have. Look at how the public has used that agency to create Wikipedia, a phenomenal collection of one of our most valuable cultural artifacts: human knowledge. But there have been limits to the reach of Wikipedia, in part because many cultural artifacts that could be part of the commons are instead enclosed by seemingly perpetual copyrights. Music is a cultural cornerstone, with nations, peoples, eras, and idealistic, artistic, and political movements all reaching for it to define themselves, much the way that individuals also define themselves based on their musical tastes. Given the importance of music to cultural identity, how much agency should we have over it, and in particular, over the portions that are supposed to belong to the public domain? An astonishing answer to this question comes from two essays written in 1966 by Glenn Gould. Even if you don’t know much about classical music, chances are good that you have heard of the Goldberg Variations by JS Bach. If so, you probably have Glenn Gould to thank for that, because when he was 22 years old, he signed a recording contract, and in six days recorded Bach: The Goldberg Variations as his debut over the objections of at least one label executive. At that time, Goldberg was far outside the standard piano repertoire and considered "esoteric." Gould was unbowed, and as Wikipedia reports, "the work launched Gould's career as a renowned international pianist, and became one of the most well-known piano recordings." Not to mention it also made Goldberg a standard for the classical piano. Gould’s decision in 1964 to cease giving public performances and to focus on recording greatly upset the music establishment, which saw such performances as the pinnacle of musical culture and which treated musical recordings as decidedly second-class. Gould addressed these criticisms not by arguing against them, but by changing the paradigm. At the center of the technological debate, then, is a new kind of listener—a listener more participant in the musical experience. The emergence of this mid- twentieth-century phenomenon is the greatest achievement of the record industry. For this listener is no longer passively analytical; he is an associate whose tastes, preferences, and inclinations even now alter peripherally the experiences to which he gives his attention, and upon whose fuller participation the future of the art of music waits. He is also, of course, a threat, a potential usurper of power, an uninvited guest at the banquet of the arts, one whose presence threatens the familiar hierarchical setting of the musical establishment. Is it not, then, inopportune to venture that this participant public could emerge untutored from that servile posture with which it paid homage to the status structure of the concert world and, overnight, assume decision-making capacities which were specialists’ concerns heretofore? The keyword here is "public." Those experiences through which the listener encounters music electronically transmitted are not within the public domain. One serviceable axiom applicable to every experience in which electronic transmission is involved can be expressed in that paradox wherein the ability to obtain in theory an audience of unprecedented numbers obtains in fact a limitless number of private auditions. Because of the circumstances this paradox defines, the listener is able to indulge preferences and, through the electronic modifications with which he endows the listening experience, impose his own personality upon the work. As he does so, he transforms that work, and his relation to it, from an artistic to an environmental experience. It is true that in Gould’s day the technology was not readily available to offer audiences such agency: in his time multi-track recording was unimaginably expensive, and available only in a few exclusive commercial recording studios. But today things are different, at least on the technology front. Ardour is an excellent Digital Audio Workstation (DAW) that allows any laptop computer to become a powerful multitrack audio editor and recording device. And the desire on the part of participant listeners is there. But the most powerful software tools in the world cannot create a compelling performance from nothing; there must be an artist who is willing to create the sonic canvas that can then be mixed and remixed according to taste. And of course there must be a commercial rights framework that does not auger the whole enterprise right into the ground. This is what makes the Open Goldberg Variations project so interesting: it is the answer to the challenge that Gould laid down 40+ years ago. It is the next evolutionary step in the musical legacy that traces from JS Bach through Gould to the present day. It invites each listener to become a participant in the future of the art of music. Kimiko Ishizaka is the artist who has made the bold move from concert pianist to cultural resource by liberating both the source code to Bach’s works (professionally typeset scores by MuseScore) and the performance data (in the form of an audio recording) to give audiences unprecedented experiences of both musical joy and the sense of freedom that comes from authentic agency. Which is to say: the agency to create; the agency to manipulate to taste; the agency to grow the commons by sharing what one is passionate about. The Open Goldberg Variations is the first big project to get some of Johann Sebastian Bach’s works open-sourced in this term ("Bach to the future"), with the aid of crowd-funding. You can download lossless audio recordings performed by Kimiko Ishizaka, and of course, the sheet music in MuseScore and Music XML formats, all being in the public domain. That is a great start. What makes it an even better start is that there is an active community making this happen. A community of diverse people who each play important roles, who work together to create what none can do by themselves. And top-notch environments that can produce commercially viable and critically acclaimed releases on a reliable basis. One such environment is The Miraverse, the experiential identity of the studios at Manifold Recording. 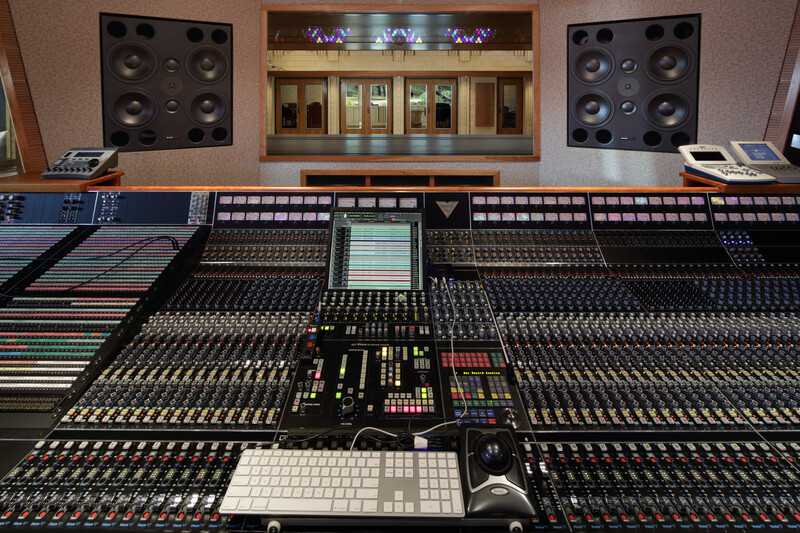 On one side of the Control Room glass is the Music Room (above), and on the other side, an API Vision analog console recording up to 64 tracks using Ardour (below). In these studios, open source music can be recorded, auditioned, and mixed with the finest audio equipment, the finest acoustic environments, and open source software. The participant listener can experience the act of recording (itself an amazing process) and also experience the creative choices that are possible once the mixing process begins. Are you interested in becoming a participant listener? Kimiko Ishizaka will be touring Europe and North America in preparation for her recording of the Well-Tempered Clavier. The first concert will take place at the Beethovenfest Bonn in Germany (September 24); from there Ms. Ishizaka will go on to perform in Prague (September 25 and 26), Munich (September 30), Vienna (October 2), Hamburg (October 12) and again in Bonn (October 18), and Ruiselede, Belgium (October 20). Ms. Ishizaka’s North American dates will take her to Ann Arbor, MI (October 23); the Pianoforte Foundation in Chicago, IL (October 26), The Miraverse at Manifold Recording in Pittsboro, NC (November 3), and the University of South Carolina, Columbia, SC (November 6). Just like any other open source project, your interest and your participation can make it not only a success, but an industry-defining success. This is our goal. By attending one of her performances, by participating in the Twelve Tones of Bach Kickstarter campaign (which is one way to purchase tickets for these performances), by attending the Recording Salon we are holding at Manifold Recording on November 3, you can fully enjoy your own experiences of the music, the community, and the prospects of recording, while helping the project and its principals achieve its larger goals. We hope to see you this fall... and long into the future! For further reading, The Audio Engineering Society chapter in Toronto has this report from their October meeting in 2012. The buzz is growing! Great article! Just a correction, Kimiko Ishizaka is married so "Ms." is not the correct title. Her husband Robert (surname Douglass) is as involved in this project as she is. Not to mention not every woman wants to go by their husband's last name. The images above were scaled to fit the the opensource.com style sheet. If you click "View Image" in your browser, you can see them in greater resolution. They make great desktop backgrounds if you are a studio geek. For twenty years running, the Grateful Dead made Forbes' list of highest-earning musical acts. Their success was, in part, due to letting their audience bring recording equipment to concerts and freely trade the recordings. The music industry refused to adopt that successful economic model. They even discouraged the entertainment press from discussing the model, and commercial radio refused to play their music. Great point Cameron. I just shake my head at all these musical artists who say no photo's or video of their shows. Many of the live shows I attend have people with smart phones, which guess what...can take photo's and video's. I say, let your fans take pictures, share them on social media, let them advertise and promote how good the show is (hopefull they're putting on a good show). I don't think sharing a snapshot of the experiece will deter future ticket sales. In fact, by my logic, it should increase them. You're not paying to listen to the music when you attend a live musical performance, you're paying for the experience. When will this industry get it? This post is a good start. Very good point. In fact, when starting Cygnus (with two other Dead Heads), we used these facts to convince ourselves that supporting freely redistributable software could grow very big. It is interesting to note that Bob Wier has built a new facility to do pretty much what I planned for The Miraverse. His facility is called TRI Studios: http://www.tristudios.com/ . Also of note, made the same decision we made in choosing our analog console (API Vision). In fact, Bob's order was entered into the queue just after our order was placed. Great minds? I've thought about this "open source music" idea quite a bit. My conclusion, that we should separate musical effects from music itself, is an admittedly subtle point. Scores and recordings are the most obvious examples of specific musical objects, and their use is easily restricted with copyright law. But for well-trained musicians who could reproduce a score from a recording, become inspired by a particular musical tidbit, or make a cover song that changes the meaning entirely and thereby becomes a new song... for us there is no closed-source possibility. Scores and recordings are like compiled programs---they're the result of a musical "source." Sure, copyrighting musical objects like recordings can make it more difficult to do some musical tasks, but it's not the same as copyrighting software. You just can't copyright or restrict artistic ideas in the same way as other things. So when you say "when will the industry get it?" (as I used to say), I think we're asking the wrong question. Real musicians already get it, and the recording industry will never want to admit it can only offer one of many possibilities. When I was on a train coming home from New York City a year or so ago, I sat next to a professional musician who toured globally. Even being successful himself, he was concerned about the future for his children who were also interested in the performing arts, especially as he knew how difficult his own life was with constant travel half the year keeping him away from a wife and children he loved. I gave him a copy of a book about "Basic Income" and suggested that was the future of music. A basic income might be a better solution to supporting creativity in the arts than copyright, which has been shown by various authors to reduce the ability of artists to create new works based on previous works. Most creative people actually benefit very little from copyright themselves, because in the global "winner takes all" model of copyright and marketing of a few superstar successes, almost all people who write books or compose songs won't make a living at it or even make more than US$2000 a year from it. You have to be reasonably good to become a star, but a lot of financial success is about luck and relationships not being the best. The performing life with its traveling demands is very rough on families too, so it is not a realistic option for most people. With a basic income of say, US$2000 a month, everyone who wants to create music or software or perform locally would have the financial support to do so; this would also support other creative arts like having more time at home for better parenting. Artists could then freely assemble together to make larger works like movies or operas or operating systems. Such a basic income right now would involve redistributing equally about one half the US GDP; the other half would still leave about the size of the 1996 US GDP to motivate people to do things no one otherwise wanted to do. A basic income also structures the economy to deal with rapidly growing unemployment from technological advances in AI and robotics and better low-maintenance long-lived designs (like the spread of LED lighting or electric cars) like foreseen in "The Triple Revolution Memorandum" in 1964. As Dan Pink, Alfie Kohn, and others write about, financial rewards actually reduce creativity; search on "RSA Animate - Drive: The surprising truth about what motivates us" and "Punished by Rewards". Still, in an exchange-based economy such as in the USA, you need ration units ("money") to exchange for rent or food. So the simplest solution conceptually is just for the government to give money to everyone through redistribution of some fraction of society's productivity as a right of citizenship, such is with Alaska's Permanent Fund which gives a check every year to every citizen based on natural resource royalties. See writers like C. H. Douglas' "Social Credit" ideas or Marshall Brain's "Manna" story. Or search on "Basic Income Earth Network". There are other approaches to supporting creativity, like improving the local subsistence economy through robotic gardening and 3D printing and rooftop solar panels, improving the global gift economy of free and open source software and physical things like by Freecycle, and improving the democratically planned economy through internet-based participation. Together, those create an alternative to ideas like copyright that are based on the idea of "artificial scarcity" which in an age of abundance and cheap computing otherwise requires a growing police state to enforce. We can do better than that. The alternative is, as with the failed "war on drugs" literally putting millions of young people behind bars in this case for sharing, where sharing, as Richard Stallman points out, should be at the core of civilized behavior. I wrote a satire about that called "Microslaw" about a decade ago, when the US Department of Justice asked for comments on some new restrictive legislation about copying. Listen to David Crosby or many other rich rock stars, all they cared about was music, and the money was a surprise and not regarded by them as entirely beneficial, personally or musically. People who love making music, make music. You might even say they are compelled to make music. People who truly love making music make it whether they get paid or not and almost everyone has to make enough to live off of and whether someone who loves making music makes their nut off of music or off driving a UPS truck, what's wrong with having a day job and who cares? It's called paying your dues and I haven't heard anyone who made it complain about having had to struggle. Indeed, looking back, stars point to their times of struggle as the source of their fondest memories, and often their most productive and authentic as well. The good stuff will for the most part rise to the top and if you know of someone who is terrific and not getting anywhere, well, who? A "basic income" is an unconditional grant to every member of a society -- effectively like getting a "Social Security" payment from birth instead of age sixty-five. So, there is no "favored group" in that sense. Sorry I was not clear about that. Search on: "About basic income". * that robots and AI are becoming more and more productive in more and more areas, either replacing human labor or enabling one human to do the work of many, as shown by the US employment level staying about the same for a decade while the GDP grew by about 30%. (Those jobs folding clothes or doing deliveries are rapidly being automated like with Wilow Garage's PR2 folding clothes or Google's self-driving cars). * further, that productivity has increased so much, that it is realistic to talk about a small fraction of the population, augmented by robots and AI, producing more than enough material goods for everyone. The most "productive" members of US society right now as far as working hard in a physical way doing paid labor at the day-to-day things that keep us all fed, keep us clothed, keep us housed, keep the garbage picked up are, and assemble things in factories, the people are for the most part, poorly paid in our exchange economy because the tasks and skills are so common and supply/demand issues related to political priorities in our society. These people are farm laborers, sweatshop seamstresses, apprentice carpenters and plumbers, road repair crews, sanitation workers, factory workers, etc.. Without them, we would very quickly starve, freeze, crash, fall ill, have no fancy computers, and so on. These jobs in the USA typically pay US$20K-$50K annually (before taxes). It typically takes two adults working full-time at the low end of this level (sometimes with one working two jobs) to have a decent life materially in the USA -- which leaves little time left over for being an engaged parent, let alone then on top of that creating free and open source software and music. Still, this ignores, as above, that much of the important "productive" labor in our society like parenting and volunteering is entirely unpaid. A family of four would be receiving $96,000 a year tax free under a basic income plan as I mentioned, and so would be better off financially to begin with, and then if one member worked as a plumber or sanitation worker, even with high taxes on income, they would have even more whatever they earned. So, the actual "productive class" would in practice be much better off, given that, as above, most truly important work in our society is not well paid. Search also on "The Impact of Inequality: How to Make Sick Societies Healthier " for a book on why overall this would make our society better off even for the financially wealthy. Copyright is one of several ways wealth gets concentrated in our society at this point. I agree with you that people who make the best music do so because they love to make music or otherwise feel a burning need to express themselves. Thus copyright for music does not make much sense as far as empowering music production, since most musical people do not benefit from it significantly. Copyright impedes remixing and building new stuff on old stuff; for example, Jazz might have never emerged with today's copyright system. By contrast, a basic income (in the absence of copyright) would give everyone who wanted to make music the opportunity to do so. Right now, there are no doubt many people bartending or working two shifts at minimum wage folding clothing who might be great musicians, or doctors, or physicists, who will never get that chance to develop their talent. Contrast with J.K. Rowling who wrote "Harry Potter" while on the UK dole and taking care of her young child -- could she have done so if forced to work two minimum-wage jobs as a seamstress and sales clerk instead? So it is not even an issue of who has developed talent and does not catch the public's eye (and there are indeed many), but also those who never get the chance to develop their talents for all sorts of reasons. A basic income would give everyone the minimum needed to develop their talents in more cases than now. Between social security, public schools, unemployment insurance, and welfare, the USA currently redistributes about US$600 a month on average to each citizen (although unequally). A basic income could replace all those programs with a more general solution requiring less paperwork. We could then get rid of copyrights as unneeded. Our popular music landscape might then also be more about cooperation than competition and self-promotion. Same for those creating software. Everyone could chose the form of education they wanted towards their path for personal growth. Since copyrights are about money, we can't discuss changing them without considering the general economics of our society and issues like "competition" (see Alfie Kohn for more on "The Case Against Competition"). IMO, though very interesting, this is open source music for people who have a million dollars, and focusing on classical music limits the appeal to less than 1% of the population, which is fine but kind of limits the potential impact. Also whether or not the music is mixed with open source is irrelevant (IMO) or at least of very minor importance compared to the license the music is released under and how the original composer interacts with her userbase and what comes of those interactions. Open source music that I would analogize to open source software would be DIY guys releasing their compositions as DAW projects along with mixes and sheet music, whether they use Logic, Pro Tools, Ardour, or whatever. You can see the beginnings of this as a grassroots phenomenon with all the remix stuff, the virtual bands (c.f. Virtual Zeppelin) and instructional videos (e.g. SFLogicNinja) on YouTube, the guitar instruction site vanderbilly.com, and people releasing DAW projects, mp3 files and sheet music at sites like mine, killersolos.wordpress.com. As a guy who has released a pretty fair amount of open source software, I have only recently recognized the ridiculous proprietariness I've had with my compositions and musical techniques. The first step to rectify this is a video showing my key techniques for transcribing music. A couple of my best compositions I am preparing release as open source. Ironically, as with software, it takes work to give things away, but I will be releasing two original compositions, Texas Boo and George Came Through, basically under the BSD license, within the next couple weeks. I look forward to your video, and think that you're doing something incredible releasing your original compositions this way. Bravo! Interesting article for non-musos and the best fit for comments from "Rock Stars". Be careful what you wish for...some of us have been studying martial arts, too! the roots of open source run far deeper.The folksong tradition evolved as a sharing of source and of samples to evolve new music and preserve old music in a pre-copyright era. Songs and lyrics and melodic themes [i.e., source code] were freely shared and remixed. The classical tradition is full of re-transcription of source works. The copyright paradigm changed this world. indeed, the efforts to "tame" this music, ranging from Alan Lomax's disgraceful assertion of copyright in others artists' works to 60s record labels seeking to copyright classic blues covers by rock bands as their own property, damaged the folk and blues tradition's sharing culture. Nowadays the place to look for open source music is not in the classical hallways,but in the vibrant netlabel movement, where artists liberally license music and liberally share "source code" in the form of samples, stems and other base components of works, all available for remixing. This movement does not receive nor seek government support, and its releases are by tradition free. It is here, rather than in the amazing work of Glenn Gould, that I find open source music becoming a reality and a transforming force. Well said! But I personally think it's interesting that Gould anticipated that technology could be a liberating, rather than a restrictive force. Obviously the RIAA has other ideas, but their numbers are shrinking and our numbers are growing. There's no more physical frontier, so corporations that must keep growing must find other public domain properties to seize and monopolize. Zoom out from the excesses of music copyright and Sony's rootkit equipped CDs, and see Disney swallowing Greek and Roman mythology and European fairy tales. Zoom out further and notice Monsanto privatizing staple crops and traditional medicine. It's the same problem on a different, bigger stage. Very interesting article... Any thoughts on pieces played on midi instruments? This can become a philosophical or aesthetic question pretty quickly, but rather than head down that rathole, I really wanted to focus on the challenges that come from recording acoustic instruments in acoustic spaces and the ways in which the open source paradigm can liberate those "unique" artistic performances. Recording midi keystrokes and gestures gets into a whole new level of hackability, but I didn't want to focus on that lest it gave the impression that acoustic performances were somehow less important within this framework. Open source music benefits young musicians throughout the world. As a young musician learns to play an instrument, listening to a quality recording or viewing the artist's technique while also being able to see the sheet music helps the young artist develop an ear and feeling for the piece. Musical genres that are perhaps not huge commercial profit centers can be cultivated and preserved for generations (for example, early blues, tribal music, etc.). Those passionate about these genres can combine open source audio, video, sheet music, historical information, even instrument fabrication and repair information. The value of open source music goes far beyond commercial music issues and will change and expand music education to reach more students globally. I think you're wrong about the "Goldbergs" being unknown before Gould. Landowska recorded them on the harpsichord at least a decade before. There are certain technical problems for the pianist due to their being written specifically for a harpsichord with two manuals, but I believe they have always been in the piano repertory. Busoni transcribed (and in my opinion butchered) them. Conversely, even today they are hardly staples like, say, the Brandenburg Concerti.